Abigail has developed a unique collection of jewellery based on the Connecting Cups. This collection consists of joyful hand sculpted silver people dancing and celebrating friendship. These little people celebrate the bonds between people is celebrated in a very unique and unusual way. Each piece is 100% unique as no one is the same, much like people, and would make a fantastic meaningful gift to someone you connect with. This collection is based on the connecting hands that the goblets had. The bonds created between people when they hold hands is something Abigail wanted to capture. These hand-shaped necklaces that resemble different hand bonds that friends, lovers, and family share. Abigail’s range consists of necklaces, earing, and cufflinks. The comical pieces will bring joy to the wearer and the viewers as well as being very different to anything that is out there. These pieces would make a fantastic gift for a loved one or a best friend that you want to share and celebrate your connection with. Abigail’s work is on display at the Craft Study Centre in Farnham where you can purchase pieces. Though if there is not a piece there that you feel doesn’t represent your connection Abigail offers a bespoke service for the jewellery. 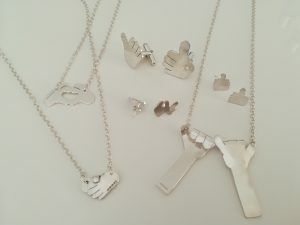 This allows you to order hands, feet or people jewellery that you will love and that are 100% unique to you. If you have any questions or inquiries about either of the collections of jewellery contact Abigail via the contact page.